Dove: So, we’ve been doing some housekeeping and found we have duplicate books. Ordinarily, I take my duplicate and/or unwanted books to charity shops. However, I can’t deal with going into a charity shop, lighting up with joy at the sight of Point Horrors, only to be crushed with the realisation that they used to belong to me. 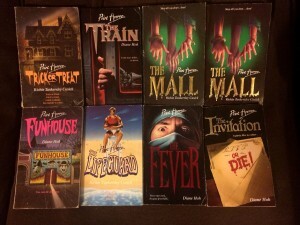 Also, we own a site about Point Horrors, so it makes sense to offer a book exchange. I, Dove, am in the UK, Wing is in the USA. So you are limited by which country you’re in as to who you can deal with. So, move to the correct section. I will happily swap any books you want – our list of books we currently own can be found here. Or, far be it from me to deny someone the PH love, if you want to send me postage, I’ll send them to you. If you write me a whimsical rhyme in the style of PH, I’ll send you any book you want. Wing is under no obligation to follow the same rules. Especially because she hates the whimsical rhymes. All books are readable. These are not fine quality books, they are old. They have been in bags, some have even been to Austria and had Ribena spilled all over them. Pretty Good: Not pristine, but as good as you’ll get with second-hand books that are nearly two decades old. No broken spines, only light wear on cover. Fair: Scratching on cover, page corners/edges worn by use. Not Great: This book has been treated badly – e.g. broken spine, ragged cover, light tearing (not necessarily all at once). It is still readable. Once again: None of these books is pristine. Click the picture below to see full size. Condition: Not Great. Worn on spine and front cover. Fold on front cover. Condition: Fair. Wearing on front cover, but largely good, corners of pages are not particularly worn. Light scratching on front and back cover. Condition: Not Great. Worn on spine and front cover. Spine broken. Scratches on cover. Slightly warped, from either bad storage or damp. Or both, possibly. Who knows? Condition: One is Pretty Good, the other is Not Great. The Not Great one has a broken spine. Condition: Pretty good. Wearing on front cover, but largely good, corners of pages are not particularly worn. Condition: Fair. Worn on spine and front cover.